Simple, really. Hot dog, mustard, potato bun. Delicious. 1) People who don’t eat hot dogs anymore. They’re grossed out by byproducts, preservatives, and the meat leftovers that usually end up in commercial dogs (which is understandable, as most mass produced hot dogs are crap). But beyond that, they say things like, “Do you know what’s in those?” as they turn up their noses. This is the fancy food crowd, really (but not the entire crowd, as we’ll see), and they don’t even eat hot dogs now that there are good organic options. They’re likely to be the people who eschew street food entirely when traveling, and they probably wouldn’t eat a crispy pig’s ear, even if you cooked it up nice for them. According to recent survey data obtained by the Council, Americans purchase 350 million pounds of hot dogs at retail stores – that’s 9 billion hot dogs! But the actual number of hot dogs consumed by Americans is probably much larger. It is difficult to calculate the number of hot dogs Americans may eat at sporting events, local picnics and carnivals. 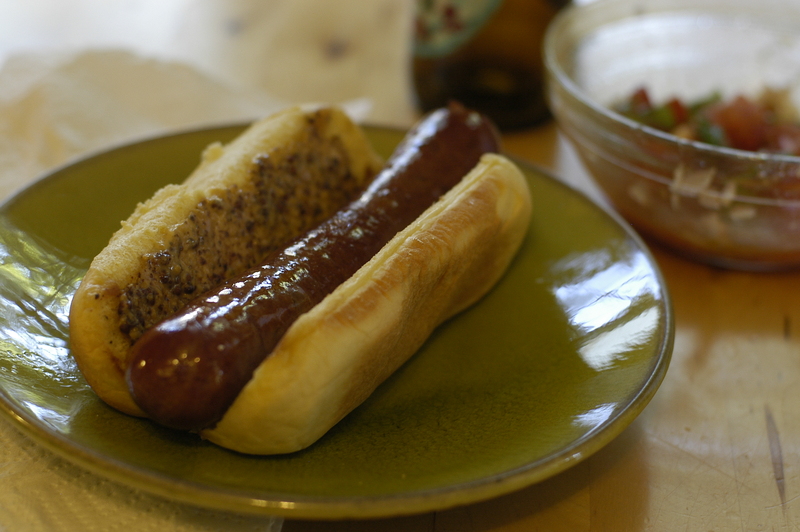 The Council estimates Americans consume 20 billion hot dogs a year – more than twice the retail sales figures. That works out to about 70 hot dogs per person each year. Hot dogs are served in 95 percent of homes in the United States. Fifteen percent of hot dogs are purchased from street vendors and 9 percent are purchased at ballparks, according to statistics from the Heartland Buffalo Company. 3) People who are making the hot dog great again. 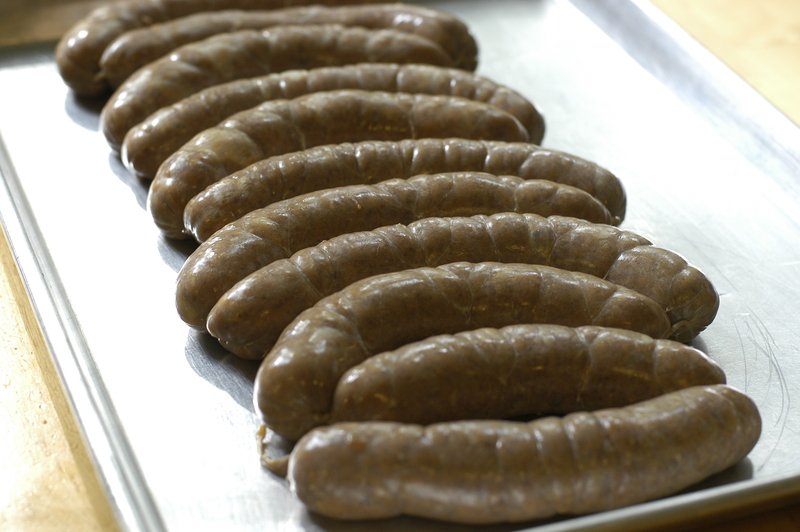 This is the other portion of the fancy food crowd, I would argue; people who are reclaiming this humble emulsified beef sausage and making it their own. I might be talking about you, dear reader, especially if you spent any time in the last month grinding, emulsifying, stuffing, and smoking your own hot dogs. These things are good. And for this crowd, the hot dog is cool again. A bit messy, but worth it. Happily, these are real food, and you can make them. 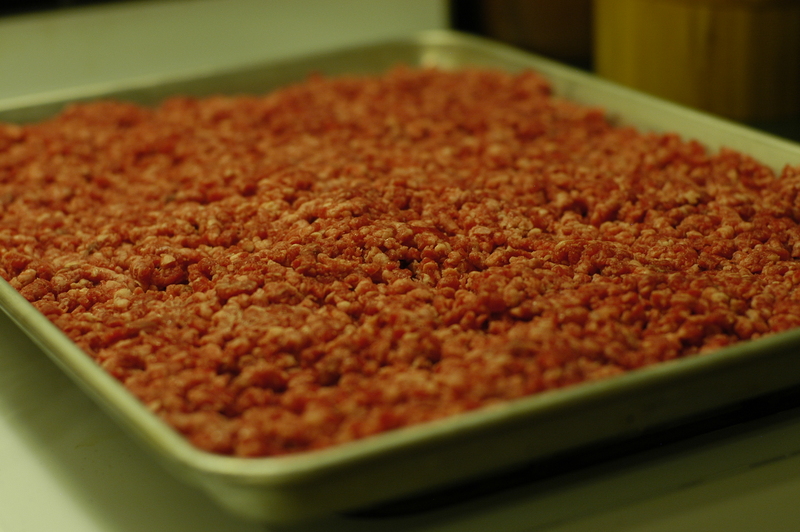 This batch was made with about 3 lbs of beef chuck, plus garlic, coriander, paprika, dry mustard, dextrose, corn syrup, kosher salt, pink salt, pepper (I used black, although the recipe called for white), and crushed ice. 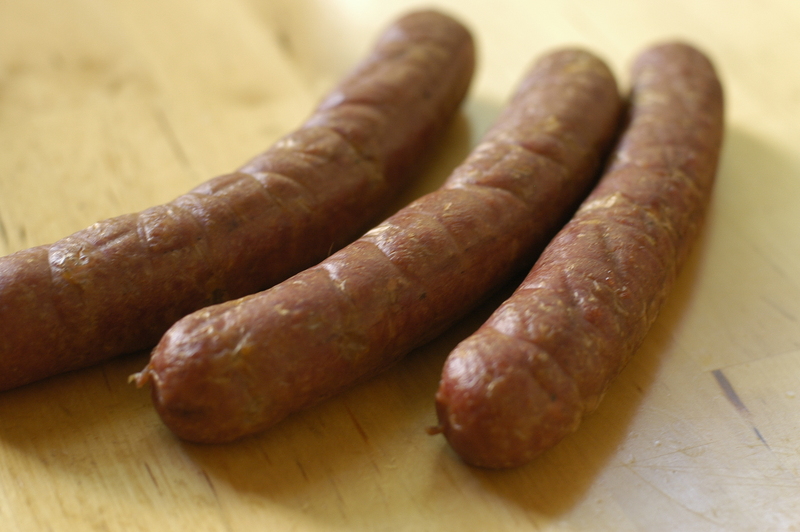 I followed the recipe from Charcuterie pretty true to form, although I didn’t use any pork fat or suet. I have the edition of the book that calls for lean beef + suet, not the boneless short ribs (what I used last year), or lean beef + pork backfat (which I can’t seem to find anywhere). See Ruhlman’s note on eGullet regarding the different recipes. I’ve also read that brisket would make a mean hot dog, and I don’t doubt it. That might be the plan for next year. After the first grind; back into the freezer. 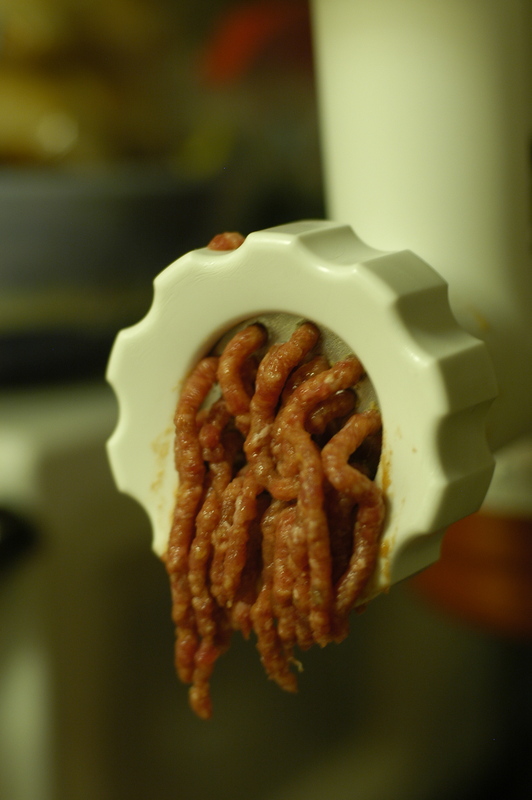 It's really just ground beef at this point, but the transformation is on the way. After the second grind and other 20 minute chill you combine the meat, fat, and spices and mix with the paddle attachment for 5-6 minutes on med-high. I didn't use the food processor. Then you chill again and stuff into casings. I made a conscious effort not to overstuff these, and I ended up with a few air pockets. Chilled in the fridge to develop a pellicle before smoking. I think chilling might be the most time-intensive step of the whole process. Not that it's hard, but it does get a little repetitive. Smoked over hickory chips for about 90 minutes; indirect heat on a Weber kettle grill. 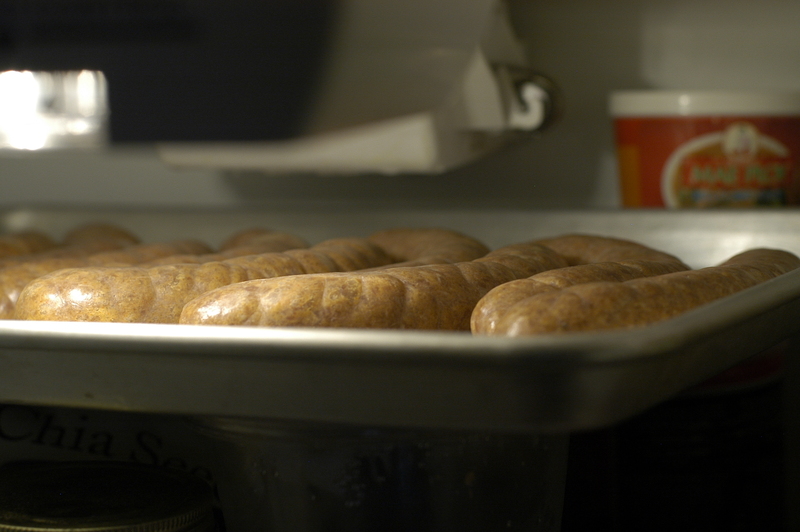 Starting to look more like hot dogs. Time for a party. 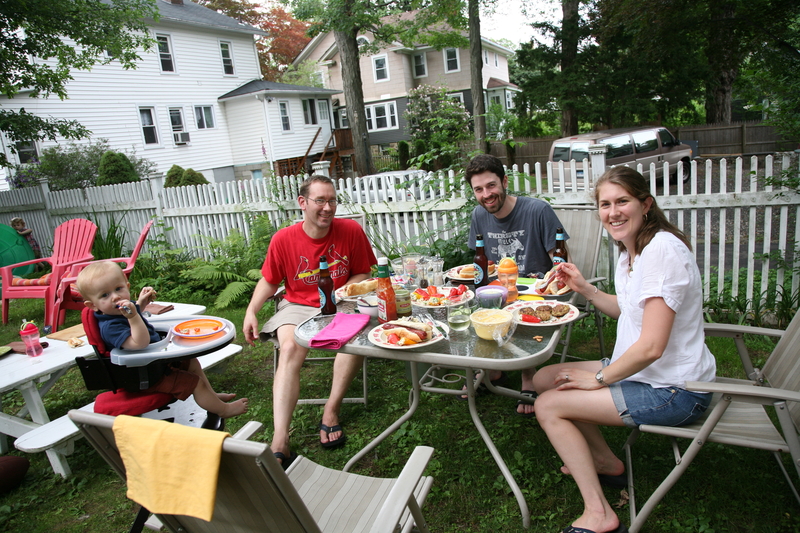 And finally, what better way to spend the 4th than with good food and friends? We were pretty happy with our spread and the company! 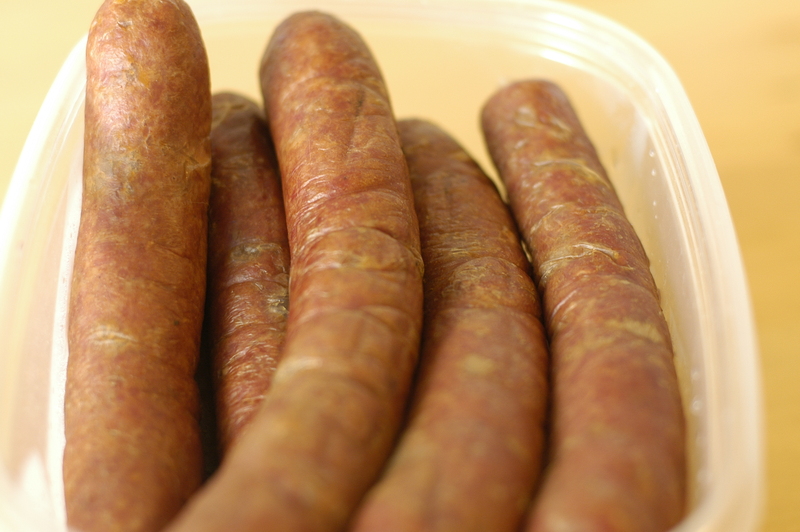 An added bonus of making this particular batch was that I had some leftover forcemeat that didn’t end up in the casing. 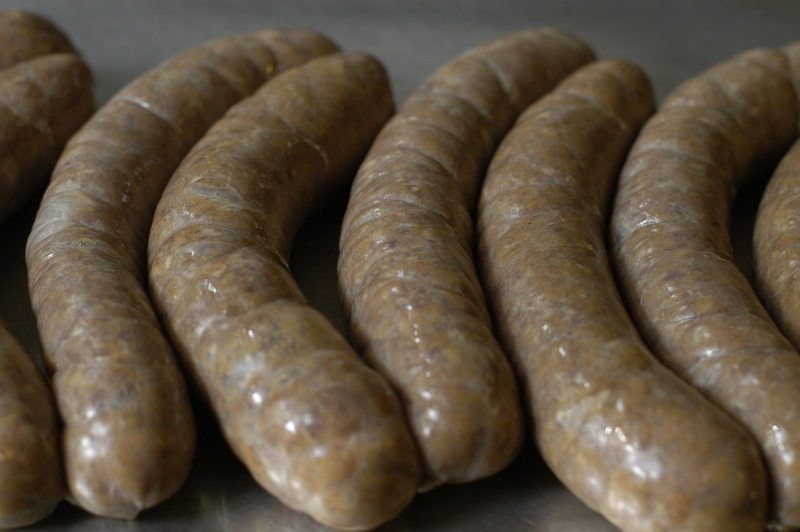 So I wrapped it in plastic (about the shape of a liverwurst or a package of frozen Jimmy Dean breakfast sausage), tied the ends tight, and poached it in 160 degree water for almost an hour, until the temp came up to 150. A quick plunge in an ice batch, and I had uncased bologna. Is this bologna? I’m not sure. But it was also good. And the kids liked it, which is even better. Extra credit? 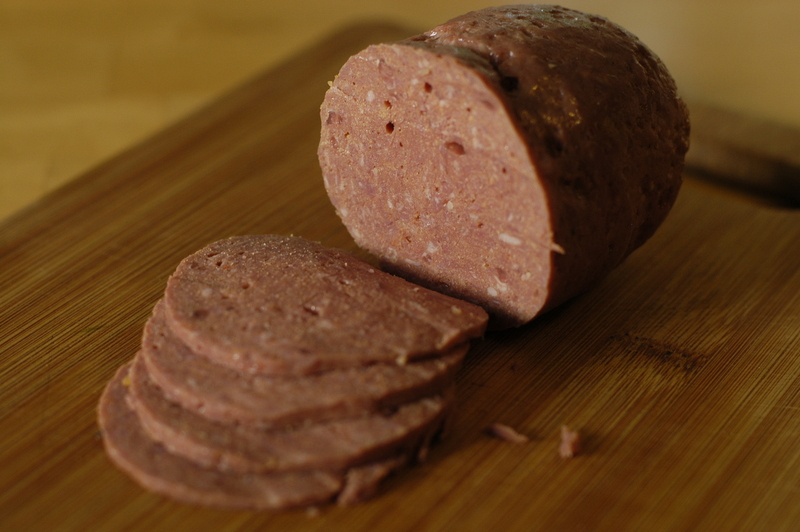 All beef bologna (or something like that). This entry was posted in beef, charcutepalooza, sausages, smoke, technique and tagged 4th of July, beef, charcutepalooza, hot dogs, j cook photography, recipes, sausage, smoke. Bookmark the permalink. I love all the background you give in this post. I’m reading through all the articles right now! I embraced the hot dogs much like you did. I hate the clean-up. I’ll always hate cleaning those attachments, but the dogs came out beautifully. Fantastic post, and you’re right, I think i could handle doing this maybe once a year. Thanks! This was the second time through for me — and last year’s were a much bigger mess. And I think slightly understuffing was the way to go (they were a much more squishy after stuffing, but I only had one blowout on the grill). It also allowed me to twist the links more than I normally do, which kept them closed as they cooked. The clean up is never fun, but I was really happy with how they turned out. Now I’ve got to get reading the other posts! Ah, but there is homemade mustard!